The CFL's international push continued Thursday as the league announced a partnership with Germany. The CFL says it has formed a long-term strategic partnership with the German Football League (GFL) designed to grow the game in both countries. The move follows a similar agreement with the Liga de Futbol Americano Profesional in Mexico. The CFL's international push continued Thursday as the league announced a partnership with Germany. The CFL says it has formed a long-term strategic partnership with the German Football League (GFL) designed to grow the game in both countries. The move follows a similar agreement with the Liga de Futbol Americano Profesional in Mexico. "Our goal is to promote the sport and help players live their football dreams," Robert Huber — president of the American Football Verband Deutschland (AFVD), which runs the GFL — said in a statement. GFL officials signed off on the move after two days of meetings at CFL headquarters in Toronto. The CFL says the first step of the agreement will see GFL players at the CFL's national combine in March, an event that traditionally showcases the best Canadian players eligible for the draft. 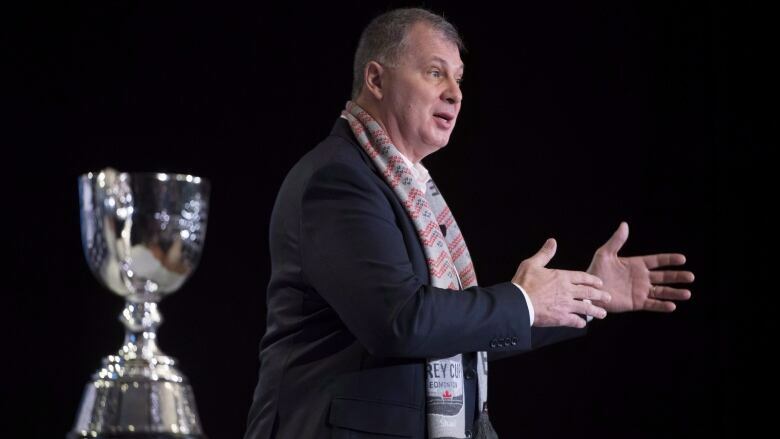 "We will share resources with the aim of helping each other on the football and business sides of our two leagues," said CFL commissioner Randy Ambrosie. The CFL says it has discussed having the opportunity for Canadian players to play in Germany once their university or junior eligibility has expired. There also has been discussion about Germans playing in the Canadian university system. The GFL features 32 teams playing in two tiers with the top 16 competing for a berth in its championship, the German Bowl. The AFVD says 450 club teams play football in Germany and the federation boasts 65,000 members. Ambrosie is meeting with other leagues across Europe next week. "Gridiron football is played and thriving in more than 30 countries," Ambrosie said. "We all owe it to our great game, our talented athletes and our legions of fans to work together so gridiron football and those who play it can achieve their full potential."